During the time of the Judges, a man named Elimelech and his wife Naomi left Israel to dwell in Moab because of a famine. They had two sons, Mahlon and Chilion. Now God had preserved Moab from the armies of Israel in the days of Moses and Joshua, because Moab was the inheritance of Lot, the nephew of Abraham. And though King Balak hired Balaam to curse Israel, still Israel didn't fight against them. The Moabites had long ago rejected the God of Abraham and Lot, however, and worshiped the false gods Chemosh and Baal. But after Joshua's generation had died, Moab's fat King Eglon exacted tribute from Israel through military force (Judges 3). He and his army held the upper hand for 18 years, until God raised up Ehud to defeat them in battle (Judges 3:30) about 1350 B.C. Now, once again, there was a degree of peace, and Elimelech was able to leave Bethlehem, Judah, and live in this neighboring country east of the Dead Sea without fear of ill treatment from its inhabitants. However, before long he died, leaving Naomi alone with her two teenage sons. And in spite of careful upbringing by Naomi, they fell in love and married Moabite girls, which was contrary to God's instructions for Israel. Mahlon married Ruth (meaning a 'woman friend'). Chilion married Orpah. But tragedy struck the family twice more. Both of the sons died. Naomi, in her grief, decided she should return to Bethlehem. For the family had been gone more than 10 years, and the famine was over. In spite of hardships, Naomi had set her daughters-in-law a wonderful example of courage, faith and obedience to her God. They loved her dearly. And when she set out to leave, they were so concerned for her welfare they decided to go with her to Israel. Naomi advised them to stay among their own people, saying she couldn't provide either of them with another son of marrying age, and they would surely find happiness with a new husband in Moab. Finally, after much embracing and many tears, Orpah heeded her mother-in-law's advice and returned to her people and her gods. But Ruth wouldn't be persuaded. She spoke those now famous words that melted Naomi's heart: "... Entreat me not to leave you, or to return from following after you: for wherever you go, I will go; and where you lodge, I will lodge: your people shall be my people, and your God my God" (Ruth 1:16, paraphrased). Naomi saw Ruth's conviction and simply stopped trying to change the young woman's mind. They continued on to Bethlehem, intending to live together on the family parcel of land. Once inside the city, the townsfolk could hardly believe their eyes. "Was this really Naomi?" Having left Bethlehem more than 1 0 years before, with a husband, two sons and some financial means, she now returned a weary, impoverished woman with a Moabite daughter-in-law. This was anything but a triumphant return. She said, "Call me not Naomi [meaning pleasant], call me Mara [bitter]: for the Almighty has dealt very bitterly with me. I went out full, and the Lord has brought me home again empty" (verses 20-21). They had returned to Bethlehem about harvest time, and since they had no food, Ruth volunteered to go into the fields and glean grain. It was the law in Israel- that some of the crop should be left by the threshers in the field for the poor (Leviticus 19:9-10). So she took her place with the poor, following after the reapers, stripping the kernels of barley off the scattered stalks left lying in the fields. By pure chance (or was it divine direction? ), she entered a portion of land that belonged to Boaz, a relative of Elimelech. Boaz was in Bethlehem at the time, but when he returned he immediately spotted her as a stranger and inquired of his foreman who she was. Upon learning this was Naomi's daughter-in-law, and knowing of the hardships they had suffered, he went over and welcomed her to his field. In fact, he told her not to glean in any other field. He suggested she stay among his own workers for protection. She could drink from his well and glean all she wanted. Bowing, she asked why such favor. And Boaz told her he had learned of her hardship, of her loyalty to Naomi and her courage in leaving her own people to become one of Israel. He also expressed his confidence that the God of Israel, whom she had come to trust, would reward her for her actions. Ruth humbly thanked him for showing such kindness to a foreigner. Then Boaz, without letting on that he was a near relative of her dead husband, invited her to eat the noon meal with his reapers. This unprecedented hospitality showed the workers that Ruth, though a poor widow, was someone special to Boaz. She ate, but carefully saved a portion for Naomi. And when she returned to the field, Boaz instructed his reapers to purposely leave stalks of grain for her — even handfuls — and to let her glean among the sheaves if she chose. Ruth worked until evening, then threshed out her grain — nearly a bushel! She took it home to Naomi, along with the food from lunch. 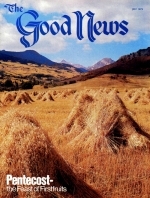 Surprised at Ruth's good fortune, Naomi asked where she had gleaned. And when told the field belonged to Boaz, she exclaimed: "May God bless him, for he had not forgotten to be kind to both the living and the dead!... the man is a relative to us, one who has the right to redeem" (Ruth 2:20). For in Israel, if a man died without legal male heirs, the next of kin had the first right to purchase (redeem) his dead relative's property to keep it in the family. If the relative left a widow and no male heirs, his close kinsman was expected to take the woman for his own wife and raise up a legal heir for his dead brother (Deuteronomy 25:5-6). So Naomi, when she saw the special consideration Boaz had shown Ruth, began to sense that God was possibly working something out in their favor. She told Ruth to continue in the fields of Boaz, working alongside his maidens. She wanted him to get better acquainted with Ruth, to see that she was a hard-working, virtuous and physically attractive young woman. Ruth, always careful to be a good pupil, followed Naomi's advice faithfully. She gleaned with the other women in Boaz's field continually until the reaping was over. They undoubtedly saw one another often, in the fields and at the noon meal. By the end of the harvest, Naomi was convinced Boaz had more than just a passing interest in Ruth. Yet, he had taken no action toward redeeming the property and wife of Mahlon, her dead son. Naomi probably reasoned that his age held him back. For Ruth was much younger. Boaz, being a considerate man, probably felt she deserved a younger husband. Naomi, however, felt sure that with the proper encouragement Boaz wouldn't hesitate. She contrived a plan. She knew Boaz was working late at -the threshing floor, and this might afford just the right opportunity to nudge him toward marriage. She took Ruth aside and had a mother-daughter talk. She explained her concern for the young woman, telling her she should be married and have the security of a home, a family and children. She also told her how this might be accomplished, rehearsing for Ruth the laws of redemption in Israel. She had observed Ruth's great respect for Boaz over the past weeks and asked her what she thought of becoming his wife. Ruth evidently had no objection. Naomi told her to bathe, put on perfume and her best clothing and go to the threshing floor. There she was to remain hidden until Boaz had stopped his work and had finished his meal and wine. He would then make a place to sleep on the straw, for during the threshing season he worked long hours and didn't bother going home at night. After he fell asleep, Ruth was to go and lie at his feet, covering herself with the edge of his blanket. Naomi assured her that this was symbolic of his rights as a near relative and was proper in every respect. Boaz would know what to do from there. Ruth left and did all that Naomi said. She quietly slipped under the blanket at Boaz's feet, careful not to awaken him. He had drunk a good portion of wine and had gone to bed feeling merry after a long day's work. He was sleeping soundly. About midnight, however, he awoke, frightened by the sudden realization that someone was sharing his bed. He gathered his thoughts and sat up. Then, peering at the form near his feet, he realized it was a woman. "Who," he asked, "are you?" Ruth replied, "I'm Ruth your humble servant: spread your protection over me as your husband, for that is your right as a next of kin" (Ruth 3:9). Boaz was elated and deeply impressed. He said, "Blessed are you of the Eternal, young woman; you have shown more kindness now than at the beginning, for you haven't sought a husband among the young men." Boaz immediately recognized this was a request to raise up an heir for Naomi to keep the line of Elimelech alive in Israel, but he also knew it was a demonstration of Ruth's affection for him. He told her, however, there was a relative of even closer relation to Elimelech, who had a greater right than himself. If that relative wouldn't exercise his right, then certainly Boaz would. He would settle the issue before the city elders, for they knew by her example that she was a virtuous woman. He told her to lie at his feet and rest until early morning, then she should slip away before the workers arrived to avoid possible gossip about a woman being at the threshing floor all night. So at daybreak they arose. He gave her all the barley she could carry and sent her home to Naomi. He waited to instruct the workers about the day's chores, then left for Bethlehem to settle the business regarding the family of Elimelech. Ruth was anxious, as you might well imagine. For she hadn't known about the other kinsman. Who was he? What kind of man was he? There was a possibility she might end the day married to a man she had never seen. But because of her fine character and concern for her mother-in-law, she was willing to do what was required to furnish the family an heir. Naomi told her to sit down and relax. There was nothing to do but wait patiently. Boaz, she knew, wouldn't rest until the business was settled. Now it was custom for the men of Israel to conduct such business inside the main city gate. Here", in the presence of respected witnesses, contracts were made, debts paid, proclamations delivered and important events discussed. Here is where Boaz waited, watching for the other near relative to Elimelech. When he saw him, he hailed him and mentioned there was business to discuss. He also gathered 10 responsible men who sat down to witness the proceedings. Then Boaz explained that Naomi, the widow of Elimelech, had no heirs and now wished to sell her land. The near kinsman had the first right, but if he chose not to exercise the privilege, Boaz would. The kinsman, however, was quick to want the purchase for his own family. Since Naomi was past the childbearing age, he supposed he wouldn't be obligated to father an heir in Elimelech's name. Then his own sons could inherit the land. But Boaz continued, explaining that Naomi's sons had been heirs to the land but died without children, leaving Ruth, the Moabitess, a widow to raise up a son in the family name. Therefore, the kinsman must also take Ruth as a wife for that purpose. At this bit of news, the kinsman immediately changed his mind. Why should he pay for land that would revert back to the inheritance of another family, especially through a son that would be half his own blood and half Moabite? It simply didn't appeal to him. He had his reasons, of course, but they were primarily selfish ones"
Boaz then proclaimed before the witnesses that he would buy the land. As kinsman with the legal right, he would also take Ruth for a wife to raise up an heir for her dead husband. So the kinsman took off his shoe, a custom that acknowledged the agreement. The elders pronounced the matter finished and pronounced a blessing on Ruth, saying God should give her children who would be honorable to Boaz and all Bethlehem. Boaz was a happy man with a happy bride. And God blessed her with a firstborn son. Naomi no longer felt the reproach of having no heir for her husband. She looked upon the child as her own, caring for him as a nurse. The women of Bethlehem praised Naomi and her daughter-in-law and blessed the infant son, saying, "may his name become famous in Israel." They named him Obed, meaning serving. And God did bless Obed. For he later had a son named Jesse, the father of King David. This was the line of Judah that formed the legal genealogy of Christ. It was preserved during this period of history by the marriage of Boaz to Ruth, a foreigner from Moab. Boaz himself was half Canaanite. His father was Salmon of Judah and his mother was Rahab, a woman of great faith who in her youth had been a harlot at Jericho (Joshua 6:25, Matthew 1:5). Ruth, though a foreigner to Israel, was a beautiful example of virtue, humility and service to the true God. For these fine qualities, she has often been cited as a type of what God's Church ought to be like — willing to forsake idolatrous kindred and lands to embrace and serve the only true God. God, in turn, has repeatedly shown that His blessings for such faith and actions will surpass one's greatest expectations.